Tonight, Army Wives returns for a fifth season with the first of 13 all-new episodes. The Lifetime TV show follows the struggles, dreams and friendships of a diverse group of women — and one man — living with their spouses and families on an active Army post. The series films in Charleston, South Carolina, and stars Kim Delaney (Claudia Joy Holden), Sally Pressman (Roxy LeBlanc), Brigid Brannagh (Pamela Moran), Brian McNamara (Michael Holden), Sterling K. Brown (Roland Burton), Wendy Davis (Joan Burton), Drew Fuller (Trevor LeBlanc), Terry Serpico (Frank Sherwood) and Catherine Bell (Denise Sherwood). 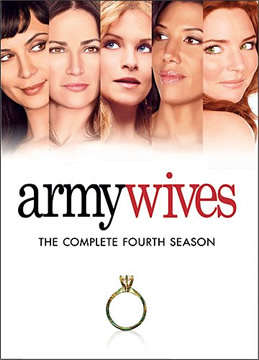 The series is based on the book Army Wives by Tanya Biank, who serves as a show consultant. To celebrate the return of Army Wives, we’re partnering with Lifetime to give away a copy of season four on DVD. In addition to the DVD set being available via Amazon and major retailers, you can find it and other products in Lifetime’s online shop. To enter to win season four of Army Wives on DVD, you need to merely post a comment below.You can enter once per day. You can also follow us on Twitter and tweet “@tvseriesfinale Hope I win Army Wives on DVD! https://tvseriesfinale.com/?p=19279“. You can enter once per day. Guidelines: This giveaway is open to participants with a United States mailing address only. (International readers can enter if they have a friend in the States who can accept their prizes by mail.) Many may enter but one person will win. You must be 18 and older to enter and no purchase is necessary. Contest ends March 14, 2011. UPDATE: Congratulations to Paul Kato who won this DVD set in our contest via a facebook entry. Thanks to everyone who played and we’ve got more contests coming!